Indian born Roghini Govindhan knows hardship. She was sold to a contractor at the age of 13 and, up until five years ago, she was working furious 11-hour days in a cramped damp room churning out match boxes. Now 24, Govindhan has taken her first trip abroad, sharing her painful experiences with audiences of Australian school students, as part of World Vision's Don't Trade Lives anti-slavery campaign. Govindhan acknowledges the rapid change in her fortunes has been dizzying. Born and raised in Gudiyattam in the Vellore District, Govindhan's teenage years and education were abruptly cut short when her family fell behind in repaying the 2000 rupees (AUD$48) loan they took to finance her elder sister's wedding. Govindhan was taken as bond by a contractor to work off the debt. Inadequate lighting and a meagre diet of rice and water led to mistakes that served to increase the interest on Govindhan's debt. Her visual memory of her ordeal is hazy. She acutely remembers voices, particularly of the abusive factory manager she simply calls 'The Man'. UNICEF estimates there are 158 million children aged 5–14 currently involved in child labour, ranging from the mining and agricultural industry to prostitution and domestic servants. According to the Indian Census of 2001, 12 million children are recognised as being child labourers. Leading NGOs put the figure as high as 44 million. 'We sort of tolerate it because we think these kids work to feed the family. We don't realise that it's modern slavery,' World Vision CEO Tim Costello tells Eureka Street. Combating child labour is a complex task as it involves understanding the cultural and economic sensitivities of third world nations. Although mass boycotting of products remains a popular weapon, it is seen as increasingly blunt as it allows child labour contractors to simply move children across to other unregulated industries. Furthermore, this approach can sometimes only serve to exacerbate the poverty that is at the root of this crisis. A 1997 UNICEF study titled 'The State of the World's Children' cites an example in which 5000–7000 Nepalese children turned to prostitution after the US banned the country's carpet exports in the 1990s. A United States Department of Labour report on Bangladesh acknowledges that contractors dismissed an estimated 50,000 children from their jobs in the garment industry in fear of the 1999 Child Labour Deterrence Act. For survival, some children were left to take on more harmful work such as stone crushing and prostitution. The steady growth of Self Help Groups in Southern Indian communities presents some of the innovation required to combat this crisis. Initiated by NGOs, Self Help Groups economically empower poor communities by generating members' income through a system of internal lending. Each group consists of no more than 20 women who regularly make small fixed deposits to the group's bank account. Once the group accumulates a healthy amount of resources it starts lending to its members. With the support of the group, members develop an understanding of credit, accountability and the importance of repayments. Most importantly, it keeps extortionate money lenders at bay. Upon hearing Govindhan's story, the women of Trust paid off the rest of her bond. 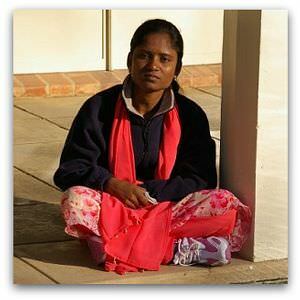 Govindhan is now on course to finishing her nursing qualifications this August. With the assistance of World Vision, Trust is using Govindhan's experience and its resources to educate neighbouring communities on laws relating to child labour and fiscal responsibility. Costello says this message also carries potency here in the developed world. The Inaugural Australian Trafficking Forum will take place at the University of Technology Sydney on Thursday 24 July. The issue of child labour will also be a focus of this year's World Vision 40 Hour Famine, being held from 15–17 August.